HOUSTON, Texas, March 23, 2104 (ENS) – A major oil spill Saturday has closed the Houston Ship Channel, preventing over 60 vessels, including three cruise ships, from transiting between the Gulf of Mexico and Galveston Bay. At 12:35 pm Saturday, watchstanders at Coast Guard Sector Houston/Galveston got a call from the captain of the 585-foot bulk carrier Summer Wind, who reported a collision between the Summer Wind and a barge containing 924,000 gallons of marine fuel oil, towed by the motor vessel Miss Susan. 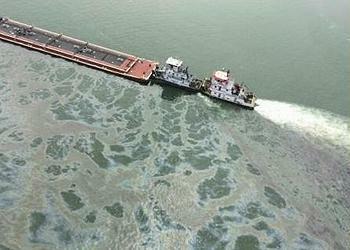 The Miss Susan was taking two barges from Texas City to Bolivar at the time of the collision. The six crew members aboard the Miss Susan are all accounted for and are in stable condition. The damaged barge, still containing some fuel oil, now sits partially submerged in the Houston Ship Channel. Kirby Inland Marine, owner of the motor vessel Miss Susan and the barges, activated its emergency response plan immediately and is working in a unified response with the Coast Guard and the Texas General Land Office, which are on scene. The area around the damaged barge was boomed off Saturday afternoon. The maximum capacity of the breached tank is 168,000 gallons of marine fuel oil. The actual amount of spilled oil is still being assessed. Roughly 35,000 feet of boom has been deployed in containment efforts and to mitigate environmental damage. Four skimming vessels remained on the scene overnight to continue recovering spilled bunker fuel oil. Operations to transfer the remaining oil from the damaged barge are expected to be complete today. After the barges are decontaminated, the damaged barge will be taken to a local shipyard for assessment and repairs. Ongoing air monitoring continues to show that there is no potential harm to residents or businesses in the area, the Coast Guard says. The primary emphasis remains the safety of response personnel working in the area and the protection of environmentally sensitive habitats, including birds and marine life. The incident response is being coordinated by a unified command, which consists of a wide variety of federal, state and local government agencies, non-profit organizations and the owners of the damaged barge, Kirby Inland Marine. Coordinating agencies include the United States Coast Guard, Texas General Land Office, and Galveston County Office of Emergency Management. Other agencies participating in the response include U.S. Fish and Wildlife, Texas Parks and Wildlife, Galveston City Office of Emergency Management, Texas City Office of Emergency Management, and the Center for Toxicology and Environmental Health. Today, the Unified Command expanded the safety zone to include all areas between Lighted Buoy 3 and Lighted Buoy 40, to prevent other vessels from interfering with the response efforts and from inadvertently spreading the oil. Calling it “a significant spill,” Coast Guard Port Captain Brian Penoyer told reporters Sunday that oil from the spill has been detected 12 miles out into the Gulf of Mexico. The Bolivar ferry is closed until further notice; anyone with questions about transportation may contact 409-795-2230. Wildlife Response Services, a Texas-based wildlife rehabilitation service has been deployed to assist with any impacted birds or marine life. People who see any impacted wildlife can call 888-384-2000. A claims number has been established for those with questions in regard to personal impact by the incident. Call 855-276-1275.